Rooster Hostel has a very homely feel to it. 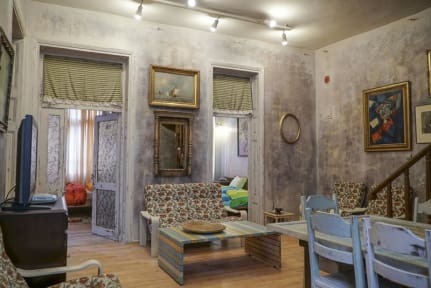 It has been lovingly restored by its owners and features antique furniture and original paintings in what’s best described as a shabby chic style. You immediately feel comfortable there. This is also enhanced by the very welcoming and helpful owners. A map featuring all the sites worth visiting and recommendations for restaurants was also provided. The restaurants were all excellent. One of the best places we’ve stayed at. 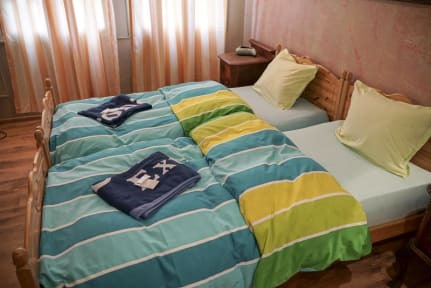 Cute homely hostel, chill vibes and very clean. Good location and helpful staff. We had a twin room and would definitely recommend. Loved the hammock on the balcony! Rooster Hostel was the best accommodation I had over two months of traveling through Central and Eastern Europe! I thoroughly enjoyed the "homey" decor and comfortable beds. Fantastic location in the Old Town with wonderful views from the balcony. I felt like a true local to Veliko Tarnovo, and a very fortunate one at that! I would highly recommend anyone and everyone to stay here if they get the chance. You will not be disappointed. Friendly and very helpful staff. Great central location. Value for money, would highly recommend! Had a great stay, the staff were really helpful, beds super comfy and bathroom were a good size. Great location and friendly staff. The vintage feel to the hostel is really quirky, we really liked that. Bit dusty. Kitchen available with free tea and coffee. Showers/toilets could do with a reconfiguration but were very clean. Disclaimer: try to arrive in south bus station, West is such an inconvenience.